Popular Science, May 1944 was already looking ahead to a brighter future. 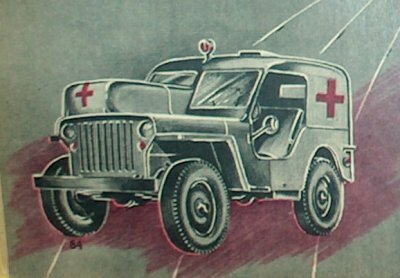 A future that included the war-time jeep, now in civilian mode. Looking at these drawings is it any wonder why so many MBs and GPWs were cobbled together to make all sorts of vehicles from all sorts of parts? Here’s a fanciful cabriolet turning the jeep into a racy creature of comfort. “Contestant Ray Ring, who made this painting of a sports jeep, wants acessories manufacturers to sell racy-looking fenders; a convertible top with a roof panel that folds forward with the windshield; a grille with removable plates to streamline headlights; combination stop light and strap buckle to hold down folded top; and supplementary arched bumpers.” “Pfc. Robert W. Huzzard, of the U.S. Army Air Forces, Wright Field, Dayton, Ohio, won a prize by suggesting that the quarter-tons be converted into ambulances and given to the American Red Cross for use in postwar relief in Africa and the Orient. His letter was accompanied by the drawing reproduced” above. “Pfc. H.E. 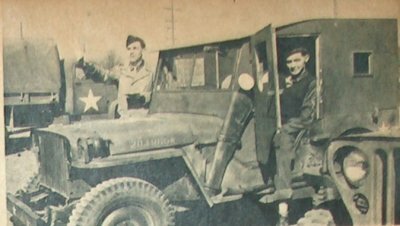 Draft and his buddies at Fort George Wright, Wash., made a convertible couple of their air-conditioned jeep, by the addition of a removable plywood cab. Accessories inlcude radio and ash trays.” This article was found by Jeff Bajczyk.